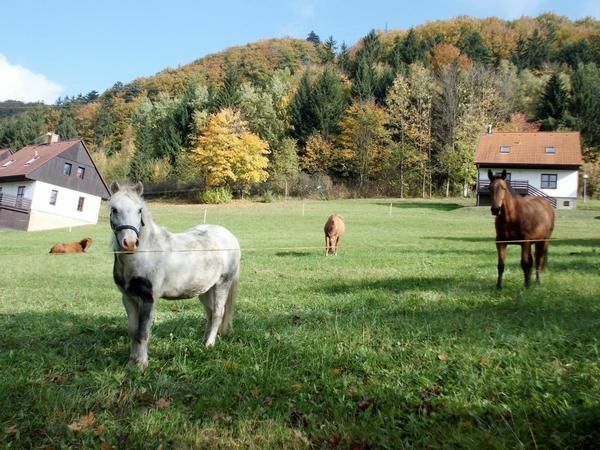 The holiday home is part of the recreation area Green Valley Park and is located in the picturesque town of Stárkov, surrounded by the beautiful nature of the Broumovsko Nature Reserve. The park offers year round comfortable accommodation scattered in 21 cottages on the slope of the green valley. The houses are suitable for 6 - 8 persons and the total capacity of the park is 145 beds. Green Valley Park is an ideal place for families with children, groups of friends, organized trips or simply couples who want to enjoy an active holiday in nature. - Final cleaning: once per object costs in the amount of 800 CZK (mandatory). - Bed linen: to rent once per person for 160 CZK (compulsory). - Internet: per object and day costs in the amount of 30 CZK (optional). - Local tax / tourist tax: per person and day costs of 12 CZK (obligatory). - Pet: per pet and day costs 80 CZK (optional). Dem gibt es nichts hinzuzufügen. Wir haben uns sehr wohl gefühlt! Alles gut aber keine Seife und Spülmittel. Die Besitzer war sehr Freundlich. Reiten ist sehr günstig. Es gibt viele Möglichkeiten zum entspannen. Besonders für Familie mit Kinder. Ich würde gern wieder gehen. Es ist eine super schöne Anlage welche für Familien im Sommer wie im Winter nur zu empfehlen. Und der morgentliche Besuch der Tiere ist mega schön. Die Umgebung hat auf jedenfall sehr viel zu bieten so das keine langweile auf kommen kann. Linen (once per person, available 5 664 EUR). Internet (per property per day, included 1 062 EUR).